Extended Families: Weapon against Child Poverty? Children living in married parent families are less likely to live in or near poverty than children in unmarried (either single– or cohabiting) parent families. Some policy advocacy groups use this to argue that marriage is the “greatest weapon against child poverty” because of the additional economic and human capital marriage adds to a household, even though there is no clear agreement about the precise ways in which parent marital status and childhood poverty interact. In fact, critics of the marriage-as-remedy position argue that economic risk may play a part in both child poverty and in the reluctance of parents to marry. As a result, they argue that economic ­– not relational – measures are the keys to reducing poverty. However, this concentrated focus on parent relationship status overlooks another form of family structure pertinent to the well-being of poor children: the residential extended family. These structures may allow families to pool economic and human resources to care for children and ameliorate the effects of tough economic circumstances. 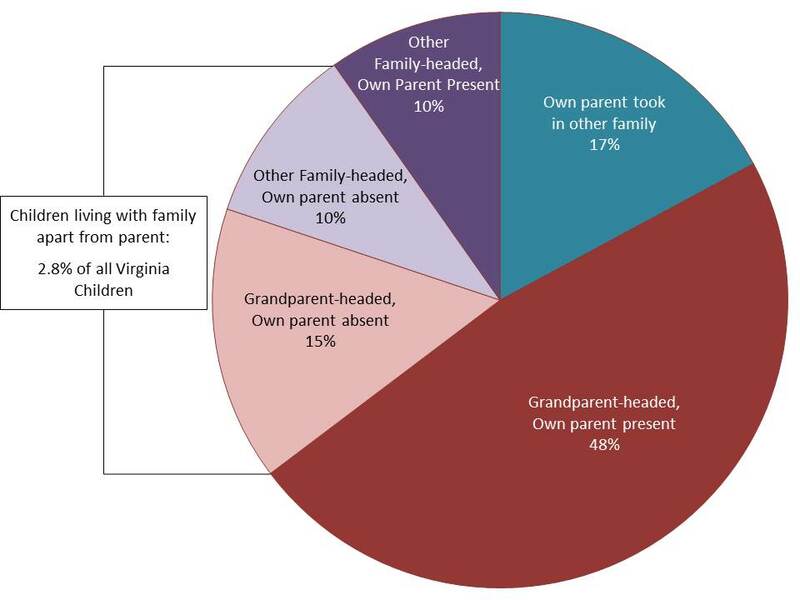 In 2011, one in ten Virginia children lived in a residential extended family. …focusing the conversation about childhood poverty exclusively on children of single parents renders invisible the largest group of children in economic insecurity: those whose parents have already taken a trip down the aisle. It turns out that the face of economic insecurity may, in contrast to the broader narrative, be a child supported by married parents. As detailed in our report, one in three Virginia children live in economic insecurity. Almost half, the largest group, live with married parents. Will promoting marriage solve childhood poverty in Virginia? In 2011, one in three Virginia children lived in economic insecurity–either in poverty or in near poverty–as defined by Virginia Poverty Measure (VPM) poverty thresholds. This statistic, among others, is discussed in depth in the Cooper Center’s newest paper, New Insights on Childhood Poverty: A Deeper Look into the Results from the Virginia Poverty Measure. About a year ago, the Demographics Research Group released a report entitled The Virginia Poverty Measure: An Alternative Poverty Measure for the Commonwealth. In the coming weeks, we’ll be revisiting this topic with another report, this time focusing on Virginia children living in economic insecurity. One of the most fundamental things that distinguishes the Virginia Poverty Measure (VPM) from the Official Poverty Measure is who “counts” as part of a family unit. While applying a different definition of the family unit is only one aspect of improving the measure of economic (in)security, it is an important change because it lays the groundwork for an accurate account of income and expenses. The official poverty rate is calculated by the Census Bureau using income limits applied to families depending on number and age of family members. Larger families have higher income limits–“poverty thresholds”–than do smaller families. Families headed by adults over the age of 65 years have lower income limits than families headed by younger adults. According to the Census Bureau, a family is one or more people living together and related by birth, adoption, or marriage. This past weekend, The New York Times published an interactive map visualizing recently released Census data on poverty in America. The NYT map gives information down to the census tract level; this level of precision allows the viewer to see poverty rates of not just counties and cities but, in fact, neighborhoods. As for Virginia, poverty rates in Southwest, Southside and Hampton Roads far exceed the poverty rates of localities closer to DC. According to these small area estimates, Falls Church County has the lowest poverty rate of around 3 percent, while Radford City and Harrisonburg City have the highest rates (34.2 and 37.5 percent, respectively). Common sense tells us that the cost of goods and services are different in different parts of the country. For instance, the economic reality and expenditures of families living in Northern Virginia are not the same as those living in Lynchburg or those living in Wise County. The cost of housing and rent is particularly variable, but other basics such as food or transportation are surprisingly different across Virginia’s regions as well. Despite common sense, official poverty rates do not account for this variability. The income threshold for poverty for a family living in New York City is the same for a similar family living in Fargo, North Dakota. More disturbingly, billions of dollars of government benefits and services are distributed to localities and families based on the official poverty measure. Other public and private organizations also use the official statistics to target their operations. With so much at stake, a new poverty measure that addresses regional differences in the cost of living is needed. The Census Bureau has recently developed the Supplemental Poverty Measure (or SPM) to do this at the national level, but states and localities are at a disadvantage. Only 3-year SPM averages are available for states and none are available at the sub-state level. Virginia, however, now has a new alternative poverty measure that accounts for regional differences in the cost of living and provides sub-state estimates of poverty rates. As elaborated in my previous post, the new “Virginia Poverty Measure” (VPM) provides some interesting insights about economic distress in the commonwealth, but perhaps the most striking results are the result of its regional adjustments. How many of us are poor? Answering that question is not as easy as one may think. Yes, we do have an official poverty statistic that is produced by the U.S. Census Bureau, but nobody likes it. Many on the Left think it is too low, failing to capture the full array of expenses that families face. Folks on the Right think it is too high because it does not account for the effects of many anti-poverty programs and tax credits on family budgets. Even the Census Bureau is not entirely satisfied with current poverty statistics. As they continue to produce the official measure, they have recently been releasing alternative statistics through the “Supplemental Poverty Measure” (SPM) program. These new numbers reflect a more nuanced look into poverty, and are widely believed by researchers and the media to better capture the actual financial circumstances of American families. But the SPM has its limitations. Primary among them is that the new measure is designed for the national level. State estimates are only available as three-year averages, and local-level estimates are not available at all. This is unfortunate for a state like Virginia, which has wide regional inequalities in terms of economics, education, and even basic demographics. Because of this, official poverty statistics don’t make sense in Virginia. A one-size-fits-all measure that defines poverty in Northern Virginia the same as it does in coal country does not work and belies our commonsense understanding of the actual resources and costs families face across regions. A better method is needed. Today, the Cooper Center is releasing its work on a new “Virginia Poverty Measure” (VPM) that will provide SPM-like estimates for Virginia and its local regions.